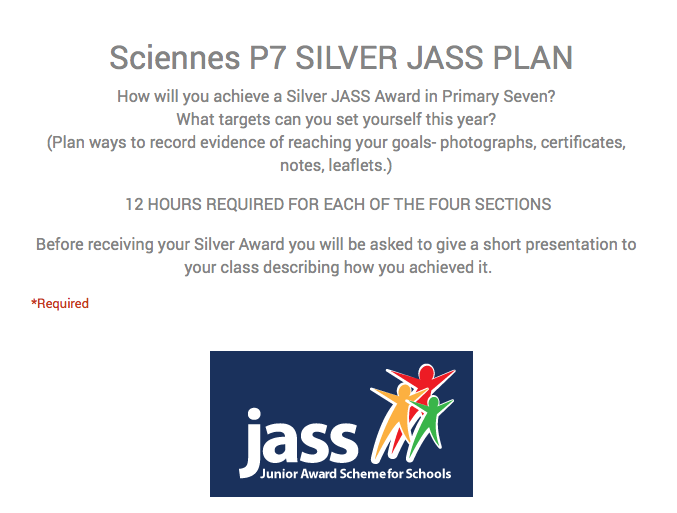 The Junior Award Scheme Scotland (JASS) is an accredited learning programme, celebrating wider achievement, for young people (P6-S2). Sciennes and Tollcross Primary Schools have been implementing this scheme since we piloted it in 2009. Pupils can aim for Bronze in P6, Silver in P7 and Gold in S1/S2 at James Gillespie's High School. The concept emerged from a discussion during a Sciennes P7 visit to Lagganlia between Alice Brown, Gael Logan and Barry Hewitt who came up with the idea to set up a 'Duke of Edinburgh' style award scheme for upper primary pupils. The scheme has since been developed into a city wide programme. The form can also be accessed by clicking on the tab at the top of this website.